In this day and age when most of the promos we get are in mp3 format, it always warms me up when someone sends an actual CD. The Leatherboys did, which earns them an additional point... unfortunately the contents of the CD do not really add much to that. The band got as far as to the televised Spanish finals in the Eurovision Song Contest a couple of years ago, so I was thinking that they would surely have some commercial potential. Well, if they do then I don't hear it. The band plays generic sleaze rock which suffers of a severe lack of hooks or melodies. You can hear some of their influences, Guns 'n Roses, Aerosmith etc, but the songwriting is on a very basic level and they not ready to compete with the big guns yet. The band plays reasonably well, but the singing is rather substandard throughout the album. There's more than enough of off-key moments here. Other than that, the production is okay... if the band had a better singer and better songs, they might have a chance. Now, I guess they'll remain local heroes. ALFONZETTI: "Here Comes The Night"
Matti Alfonzetti first came to my attention, as he did for many others, as the lead singer of Jagged Edge at the arse end of the 80s. After that fell to bits he has done all sorts of stuff, including writing for The Poodles, fronting Road To Ruin, and putting out a couple of very good solo albums. Well, nine years after the last one he’s cobbled together another first class set of tracks, writing, producing, singing, playing and probably cleaning the studio toilets as well. I’ll freely admit that “Here Comes The Night” took a few spins to grab me, but when it did it certainly didn’t want to let go, and as I sit here I’m listening to it for the 6th time on the trot and quite happy to do so. Alfonzetti sounds as good as he ever has, and has done a decent job on the production as well. The songs are good, solid, hard rock fare that will be accessible to any fan of classic rock, and especially any existing fans of his work. Mostly mid paced, the best moment is when things heat up a bit on “Rock & Roll Heart”, but in truth there’s not a naff track in sight. The wheel has unsurprisingly no been reinvented here, but Matti Alfonzetti has been a consistent provider of quality hard rock for many years now, and with “Here Comes The Night” he continues to a great job. As frequent reader - if not then it is about time - of this website you may know that I am a huge Porcupine Tree fan. Founder, guitar player, singer and main composer Steven Wilson is a true workaholic and besides PT also involved in Blackfield and No-Man. 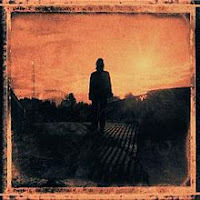 In 2008 Wilson released his first real solo album and I found it rather too dark, too melancholic, too experimental and too weird even for my taste... Now, three years later Wilson comes up with a double album called "Grace For Drowning" and again it is dark, melancholic, experimental and sometimes weird however I think/feel that the music on this new release is much better than on its predecessor. CD1 called "Deform To Form A Star" kicks off with two instrumentals being "Grace For Drowning" and "Sectarian" and they are both rather jazzy and filled with lots of piano passages. These songs set the trend for almost the entire album as the more metal oriented work from Steven is again hard to find on this record. So if you only like Wilson's heavy music then I think that you might be disappointed, but give this album a chance and you will hear the beauty of it. Musical highlight is the 23 minutes epic "Raider 2", a very complex song with lots of musical influences from the roaring seventies and while listening I got memories of notorious bands like Van Der Graaf Generator, King Crimson and even Camel. The guest musicians list on this abum is impressive as Wilson called in the help of Theo Travis, Nick Beggs, Jordan Rudess, The London Session Orchestra and the Synergy Vocals Choir, both led by Dave Stewart. The music on this album is overwhelming and after a couple of spins you seem to get addicted; so try it out, play the album at maximum volume and be amazed!! GRAND ILLUSION: "Prince Of Paupers"
It’s occurred to me that I’ve been enjoying the album for ages now, yet haven’t bothered to review it, so sorry and all that, it’s no reflection on Grand Illusion, who actually rock like hurricanes. Big hurricanes, with knobs on etc. Coming from what seems to be the Land Of AOR, Sweden, Grand Illusion take just about everything you like about AOR and smush it together into one big, wonderful lump. The standout performance on the album for me comes from vocalist Peter Sundell, who has a amazing voice very similar to Zeno’s Michael Flexig, and when he lets it loose you feel like punching the air in respect of the awesomeness of it all. Combine this with Anders Rydholm’s guitar solos that never outstay their welcome, as well as additional vocal duties from the silky voiced Per Svensson, and you get a band that is, at it’s core, quite impossible to fault. The songs are pretty damned cool as well, and I suggest if you want a taster track down opener “Gates Of Fire” on YouTube. If you enjoy that (and you will if you are human and have functioning ears) then this is the album for you. It’s stuffed full of upbeat, melodic tracks and catchy choruses, helped by an excellent production job by Anders Rydholm, who is basically the creative force behind the band. Certainly one of the best releases this year, “Prince Of Paupers” breaks no new ground but doesn’t have to. Melodic, well paced, catchy and occasionally possessing of moments that deserve to be preserved in ice for future musicologists to discover and marvel at, this is AOR in it’s purest form. 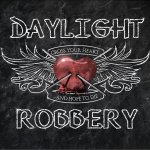 The UK rock scene becomes a little more interesting this week, with the release of this, the debut album from Birmingham’s Daylight Robbery. It’s been a long time in the making, as the band were together in the 90’s but never actually recorded anything. This album throws together some of those songs and some brand new compositions, with the result being uneven at times but always interesting. Now I don’t know what the balance is between old and new songs, but the first six tracks on the album are very solid melodic rock tunes, held together by a good blend of guitar, keyboards and some powerful vocals by Tony Nicholls. “Cross Your Heart” opens the album with purpose, and is a treat for fans of Shy, Magnum and Terra Nova, with a good, simple backing riff overlaid with keyboards and a nifty solo. Nicholls has a nice, strong voice that can reach some high points when needed, and the whole impression is of a band who know exactly what they’re doing. This carries on for the first six songs, which include an ambitious slower track “Crossing The Great Divide” which rolls in at 8 minutes and works pretty well. Track 6, “Real Love Is The Answer”, is a really cool melodic track with a catchy chorus that uses a similar structure to Madonna’s “Respect Yourself”, and one I keep coming back to. The last four tracks seem more dated, possibly because they lack some of the subtlety of the rest of the album. They are faster and heavier, and tome sound more like a band still looking for an identity. As I said, I don’t know if these are earlier compositions, but the tone of the album definitely changes in the final third. It’s still pretty good melodic rock, but with less of the spit and polish of the first 6 tracks. Overall, however, this is a very good debut that’s been along time coming, and it gives Daylight Robbery a very solid platform to build on. After eight years in retirement (although we did get two excellent Hard Rain albums) 2002 saw the return of Magnum, retaining the original trio of Bob Catley, Tony Clarkin and Mark Stanway, aided and abetted by bass basher Al Barrow (who was also handy for a couple of album covers), and drummers Jimmy Copley and Harry James. 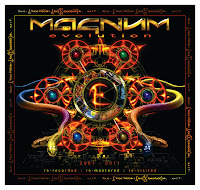 Nine years gave us five albums of varying quality, and now Magnum have made the interesting decision to give us a “Best Of…” package comprising purely of tracks from these albums, plus two new ones to sweeten the deal. Considering Magnum have been playing plenty of newer material on tour over the last few years, “Evolution” is a perfect jumping on point for anyone who is a lapsed fan. The real surprise is that the two tracks chosen from each album are, in my opinion, the best ones. There’s no ballads here, just big riffs and punchy melody, with some studio tampering to beef them up even more (although to be honest it’s not something that was needed or is, to me, that noticeable). The two new songs are the most interesting, as they turn out to be amongst the best on the album. “The Fall” has a superb melody and a nice, mid paced gallop to it, with a central melodic riff that will echo through your head for a long time - definitely the best track here. “Do You Know Who You Are” finishes off the album, and it’s another corker with a similar pace. Both songs could have graced “Vigilante” or “Wings Of Heaven”, and I sincerely hope that Clarkin keeps up this style for the next album, because it’s time for Magnum to be more upbeat and fun again. So if you used to like Magnum and sort of fell by the wayside, “Evolution” is a perfect buy, and even if you have the albums that have been sampled, you really need to hear the two new tracks and enjoy the brilliant cover from Al Barrow himself. If this was a totally new album it would be a ten out of ten, so make of that what you will, but have a listen anyway. KILMARA: "Don't Fear The Wolf"
The best songs on the album are - at least accoring to yours truly - "Let Sadness Be Destiny" (a power metal epic), "You Better Run" (really powerful and energetic) and "Show Me The Way", which is bombastic, fast and has some excellent riffs. However the boring semi-ballad "Blindfold" is completely redundant and the rest of the songs are so so, but not really catchy and classic power metal songs. The band needs to work on their compositational skills and their own sound and then I think these Spanish rockers could really get somewhere. 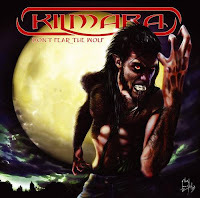 If you are a fan of heavy power metal music then you should at least listen to "Don't Fear The Wolf" and maybe or probably you will like it and buy the album. I am looking forward to their third album, featuring Kilmara with a distinct heavy sound of their own! Minutian is a Finnish prog rock band and "Repercussions" is their debut album. If you listen to the album for the first time you will notice the rather old-fashioned high pitched vocals of singer Mikko Heino and the excellent percussion parts that give this album an extra dimension. The band has obviously been influenced by bands like King Crimson, Oceansize, Mastodon and Tool and especially the heavy guitar riffs do remind me of Tool. The music on the entire album is extremely rhythmically oriented, but sometimes the band goes a little bit too far and the music comes across as rather chaotic. Personally I like the last track, which is instrumental, "Three By Five" the best as I sometimes have trouble with the rather "annoying" voice of Mikko. This song is also the heaviest song on the album and the rhythm section - drummer Antti Ruokola and the bass player Jouri Mikkola - are at its best here! Another great song is the longest track on the album called: "Isolation"; a well built-up song with great instruemtnal passages, but also some nice vocals. All in all I can say taht Minutian has made a very decent debut album and I am already looking forward to their second, most probably, better release. Last advice: play at maximum volume!! 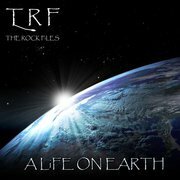 THE ROCK FiLES: "A LiFE ON EARTH"
TRF, better known as THE ROCK FiLES is a Dutch melodic rock band and with "A LiFE ON EARTH" they finally release their amazing debut album. It took almost ten years to finally release this album, but now you can enjoy this concept album over and over again. TRF is in fact Adjan Emmen's band, a guy who has been in the music business for more than 25 years already. Besides Adjan, the guitar player, the band consists of Jerry ten Bhomer (vocals), Rutger Klijn (bass guitar) and Pim Kooiman (drums) and on "SiNKiNG" Marco Hoogerheide plays the keyboards. The eleven songs on the album are all beautiful melodic, symphonic rock tracks featuring marvellous guitar melodies and superb vocal parts. The lyrics deal with life on earth as we know it and in the end gives us a message of hope; stating that how miserable you feel or how low you have fallen there is always hope! "DESPAiR" is a nice semi-ballad in which Jerry shows what he can do with his amazing voice and Adjan's guitar melodies in this particular track are more than excellent. The instrumental "SiNKiNG" is the next musical highlight, featuring again some awesome guitar melodies and solos. "PRECiOUS" is another ballad which really gives me goosebumps, mainly due to the astonishing guitar melodies and the emotional vocal passages; this is a song that truly reminds me of Queensryche's "Silent Lucidity"! The album ends with "FAiTH", a very well composed rock track with beautiful melodies and lots of diversity. After 51 minutes this album ends and then you will want to hear it again because the music really grabs you by the balls!! A perfect debut and I am sure that we will hear a lot more from TRF in the future. If you like melodic,symphonic rock music with outstanding guitar work and excellent singing then A LiFE ON EARTH is a MUST!! It’s a sad day for music when one of the most talented vocalists around decides to lay his recording career to rest, but that’s the case with Brian Howe, a man so much more than the label “former singer for Bad Company” ever suggests. Owner of one of the most soulful rock voices to come out of the UK, he can hold his head high against the likes of Paul Rodgers, Danny Bowes and Glenn Hughes. With this five track EP he has decided to give fans a personal, intimate goodbye, with no record companies involved. It’s no secret that I am a massive fan of Howe’s vocals, from the time he revitalised a flagging Bad Company to his solo work, he imbues every song with a passion and emotion that gets deep into your being. “Emotions”, then, is the perfect title for his final release, with the songs very much on the mellow side, each dripping with, well, emotion. “I’m Still There” and “Runaway Train” have a bit more pace, but you’d have to have a heart of stone not to listen to the closing track “Christmas” and not feel something. 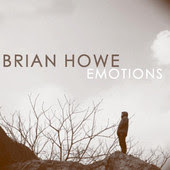 Any of the songs here would have been welcome on Howe’s last full album “Circus Bar”, which was my album of the year for 2010 (and still gets played at least once a week). Vocally, Howe is as perfect as ever, balancing power with subtle nuance, lifting each song that little bit higher than another vocalist might have done. If you’ve ever enjoyed one of the 7 albums Howe has been involved in (a shockingly low number, really) then you owe it to him, and yourself, to download this (from iTunes) and enjoy the swansong of a true Voice Of Rock. Hey, if enough of you do it he might just be persuaded it’s all worth doing again. 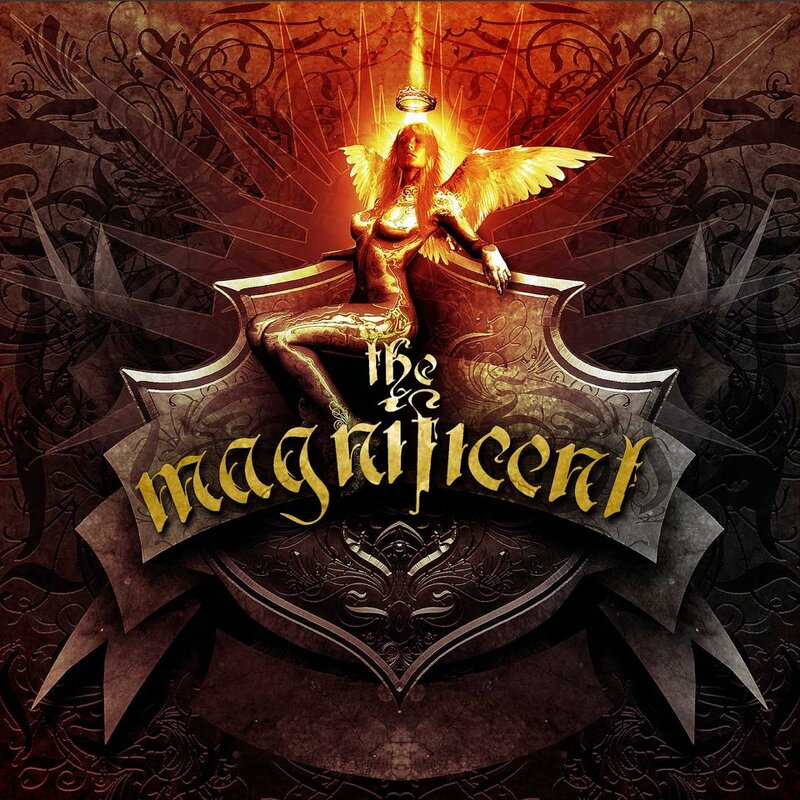 It would be quite pathetic if a band called THE MAGNIFICENT were merely "decent" or "mediocre". No such worries here, this band does live up to its' ambitious name, providing us one of the finest albums of the year. 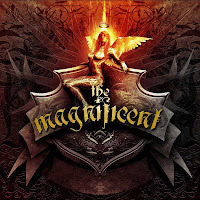 Built around the talents of guitarist/songwriter/producer Torsti Spoof (Leverage, Place Vendome) and vocalist Michael Eriksen (Circus Maximus), The Magnificent isn't a typical "Frontiers" project. For one, the songs do not originate from the "usual suspects" (Peterik, Martensson, Martin bros etc), instead Spoof and Eriksen have pretty much done it themselves, with a little help from their bandmates in their other bands. Fans of Leverage and Circus Maximus should take note that The Magnificent isn't quite as heavy as those bands. We're talking about highly melodic, keyboard-drenched AOR along the likes of Treat, TNT's lighter moments, Masquerade, Zinatra, Brother Firetribe... indeed, many of these songs would be right at home on a Firetribe album, and if BFT were to continue without Emppu because of his Nightwish duties, in Torsti Spoof they'd have a suitable replacement in the "inner circle". He throws in some very tasty guitarwork here, always very melodic. Eriksen does a good job too, at times sounding a lot like Joey Tempest. Finnish readers might get a chuckle out of the fact that there are moments where he sounds like a deadringer to one Ressu Redford (Bogart Co etc). There's a cloud of familiarity hovering above the album - you'll probably find a few familiar sounding riffs or melodies here and there but nothing too obvious. Of course that could be said of most albums in the genre... The highlights of the album for me are "Cheated By Love" (very TNT'ish guitar work and a killer hook), "Fallen Angel" (a touching song about a tragic loss of a loved one), "Satin & Lace" and "Lost", to name a few. The only song that somehow doesn't work for me is "Bullets", but otherwise... it's all quite magnificent. Neil DANIELS: "Rock Landmarks: Judas Priest - British Steel"
Daniels has previously written a good unauthorized biography of Priest, so he's definitely qualified to put together a book like this. What you'll get is a rather indepth look at the situation where the band was when it was about to start recording this, plenty of information about the recordings and the "aftermath" of "British Steel", the hit singles, videos and the tour that followed. There's a thorough and enthusiastic review of the album by the author and lots of additional info about the various versions of the album, even the tour dates of the "British Steel" tour. Maybe the only thing that's missing is the input from the band members. It would have been quite interesting to read what do they think of "British Steel" and its' songs these days. If you're a fan of the band, this is worth picking up to accompany your copy of the album. The prices is comparable to the size of the book!